A recent market study published by the company – “Smart Inhalers Market: Global Industry Analysis 2015 – 2017 and Forecast 2018 – 2026,” consists of a comprehensive assessment of the most important market dynamics. By conducting a thorough research on the historical as well as current growth parameters of the smart inhalers market, the growth prospects of the market are obtained with maximum precision. The report features unique and salient factors that may have a huge impact on the development of the smart inhalers market during the forecast period. It can help the players to modify their manufacturing and marketing strategies to envisage maximum growth in the smart inhalers in the upcoming years. The report provides detailed information about the current and future growth prospects of the smart inhalers market in the most comprehensive way for better understanding of the readers. The report commences with the executive summary of the smart inhalers market, which includes the summary of key findings and statistics of the market. It also includes the market value (US$ million) estimates of the leading segments of the smart inhalers market. Readers can find detailed taxonomy and the definition of smart inhalers in this chapter, which will help them understand the basic information about the smart inhalers market dynamics, disease epidemiology of asthma and COPD, ice-berg analysis, pricing analysis, and list of the key participants included in the report. This chapter includes a detailed analysis of the growth of the North America smart inhalers market along with a country-wise assessment including the U.S. and Canada. Readers can also find regional trends, and market growth based on product type, disease indication, distribution channel, and country for the smart inhalers market in North America. The readers can find detailed information about factors such as, regulatory scenarios and regional trends that are impacting the growth of the Latin America smart inhalers market. This chapter also includes the growth prospects of the smart inhalers market in leading LATAM countries such as Brazil, Mexico, and Rest of Latin America. Important growth prospects of the smart inhalers market based on its product types, along with disease indication in several European countries, such as EU4, the U.K., and Rest of Europe. Greater China, India, Japan, ASEAN, Australia, and New Zealand are the leading countries in the APAC region that are the prime subjects of assessment to obtain growth prospects of the APAC smart inhalers market in this chapter. The readers can find thorough information about the growth parameters of the APAC smart inhalers market during the period 2018-2026. This chapter provides information on how the smart inhalers market will grow in the major countries of the MEA region, such as GCC Countries, Turkey, Iran, Israel, and South Africa, during the period 2018-2026. In this chapter, readers can find a comprehensive list of all the leading stakeholders in the smart inhalers market along with detailed information about each company, including company overview, revenue shares, strategic overview, and recent company developments. The players featured in the report include GlaxoSmithKline Plc., Novartis AG, Teva Pharmaceutical Industries Ltd., AstraZeneca plc, Boehringer Ingelheim, Aptar Pharma (AptarGroup, Inc.), Propeller Health, OPKO Health, Inc., H&T Presspart Manufacturing Ltd., Sensirion AG, and Cohero Health, Inc. This chapter explains how the smart inhalers market will grow across various geographic regions, such as North America, Latin America, Europe, Asia-Pacific, and Middle East & Africa (MEA). Based on the product type, the smart inhalers market is segmented into DPI-based smart inhalers and MDI-based smart inhalers. In this chapter, readers can find information about the key trends and developments in the smart inhalers market and market attractive analysis based on the type of products. Based on the disease indication, the smart inhalers market is segmented into asthma and COPD. In this chapter, readers can find information about the key trends and developments in the smart inhalers market and market attractive analysis based on disease indication. Based on the distribution channel, the smart inhalers market is segmented into hospital pharmacies, retail pharmacies, and online pharmacies. In this chapter, the readers can find information about the key trends and developments in the smart inhalers market and market attractive analysis based on distribution channel. This chapter helps readers to understand the research methodology followed to obtain various conclusions, important qualitative information, and quantitative information about the smart inhalers market. The increasing prevalence of respiratory disorders like asthma and COPD majorly contributes to driving the growth of the global smart inhalers market. Increasing prevalence has led to a surge in the demand for efficient respiratory care, in recent years. Moreover, it is also observed that the healthcare professionals, especially in developed regions are getting inclined towards the adoption of smart inhalers for the delivery of drugs directly to the respiratory tract of patients so as to increase the efficacy of drug delivery and maintain track record. Nowadays, connected devices for asthma and COPD, especially smart inhalers, which accurately monitor, track, and prompt medication use are extensively available. Smart inhalers are robust, accurate, and collect clinical data. The respiratory inhalers available at present are insufficient for the adequate treatment of asthma and COPD. Physicians often lack the tools and information to understand the patient's state of health. This scenario suggests that rather than simply offering incrementally better medicines, smart inhalers provide new ways of delivering and activating patient self-management. Connected inhalers benefit from the miniaturization of flow sensors to evaluate the volume of medication inhaled. For instance, Sensirion, a Switzerland-based company, has developed SDP3x (a differential pressure sensor), which can be integrated into smart inhalers. Miniaturization also enables the development of systems, making them furthermore user-friendly. The treatment cost associated with respiratory disorders is generally considered as a major issue for payers, patients, and prescribers. Presently, in order to reduce the burden, prominent respiratory pharmaceutical and digital health companies are forming strategic partnerships in order to develop new technologies and pave way for innovation in digital healthcare. Smart inhalers are introduced as a novel approach to promote adherence by monitoring medication use on the basis of respiratory disorders. It is also observed that there is a significant opportunity for smart inhalers to improve outcomes and reduce treatment costs. In clinical studies, 80% adherence to preventative medication has been observed among asthma patients using smart inhalers, with a 61% reduction in oral steroid use. This could significantly reduce the overall costs associated with the treatment of respiratory disorders and increase the adoption of smart inhalers. Leading manufacturers of smart inhalers are focusing on collaborating with digital and software companies in order to serve the targeted population. Moreover, such collaborations also help manufacturers launch their products more conveniently as well as enhance their distribution channels. Propeller Health, a leading digital health solution provider for respiratory medicine, collaborated with Novartis AG to develop a custom add-on sensor for the Breezhaler inhaler, a smart inhaler used for COPD treatment. AstraZeneca plc formed a digital health partnership with the digital health company Adherium to manufacture smart inhalers. The lack of awareness regarding the symptoms of asthma and COPD has resulted in a vast majority of people suffering from respiratory illnesses remaining undiagnosed and, therefore, untreated. This is a major factor hampering the growth of the global smart inhalers market. A majority of people with COPD symptoms are unaware about the disease and low-economy countries account for 90% of the deaths related to COPD. The use of smart inhalers is not yet widely supported within the public health system. This can be attributed to the limited reimbursement scenario and low awareness among patients regarding the technology. Moreover, the limited availability of the device creates an obstacle, which would directly affect the overall growth of the smart inhalers market as per the current scenario. The competition section of the report features profiles of key players operating in the smart inhalers market based on their market share, product offerings, and differential product marketing strategies. 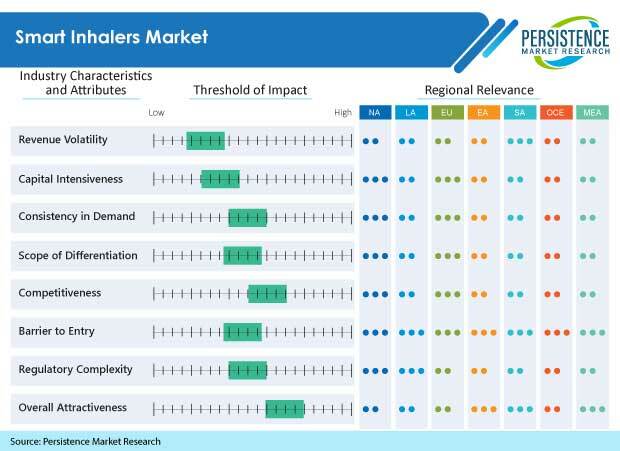 Few key players featured in the smart inhalers market report include GlaxoSmithKline Plc., Teva Pharmaceutical Industries Ltd., Novartis AG, AstraZeneca plc, Boehringer Ingelheim International GmbH, Aptar Pharma (AptarGroup, Inc.), Propeller Health, OPKO Health, Inc., H&T Presspart Manufacturing Ltd., Sensirion AG, and Cohero Health, Inc.
A smart inhaler is mainly a respiratory inhaler that is equipped with a digital sensor. The sensor tracks data such as dosage timing, monitors the use of the inhaler, and schedules the next dosage. Smart Inhalers are able to generate alerts for everyday dosage using smart devices like phones or tablets connected to the sensors via bluetooth. Smart inhalers are designed to treat respiratory disorders such as asthma and COPD. The report on the smart inhalers market offers a comprehensive evaluation of the business opportunities in the smart inhalers market along with insights on the smart inhalers competition blueprint, pricing analysis, epidemiology study, iceberg analysis, list of key distributors, and suppliers in the smart inhalers market for the duration from 2018 to 2026. The report offers a comprehensive taxonomy of the smart inhalers market on the basis of product type, disease indication, distribution channel, and region. On the basis of product type, the global smart inhalers market has been segmented into DPI-based smart inhalers and MDI-based smart inhalers. On the basis of disease indication, the global smart inhalers market has been segmented into asthma and COPD. On the basis of distribution channel, the global smart inhalers market has been segmented into hospital pharmacies, retail pharmacies, and online pharmacies. From a geographical perspective, the smart inhalers market has been segmented into North America, Latin America, Europe, Asia Pacific (APAC), and Middle East & Africa (MEA). What is the revenue potential of the smart inhalers market across the regions of emerging economies? Who are the key competitors in the smart inhalers market and what are their portfolios? What are the major challenges influencing the growth of the smart inhalers market? The smart inhalers market has been estimated based on a company share analysis approach. A triangulation methodology is adapted to derive the smart inhalers market size, which is primarily based on basis of disease epidemiology, prices of smart inhalers, adoption rate of smart inhalers, and others to obtain market estimations and insights on pharmaceutical and digital companies associated products, technologies, and applications. Furthermore, this information is further validated with primary research (including viewpoints of seasoned analysts, surveys, and interviews) and secondary research (including resourceful databases, authentic trade journals, and verified paid sources). The research study on the smart inhalers market also includes macroeconomic factors and top trends shaping the global smart inhalers market. With this approach, the report on the smart inhalers market projects the industry attractiveness of each major segment in smart inhalers over the forecast period.